Mac monitoring software secretly records all typed keystrokes details in invisible mode. Now you have the command to record everything performed by the external user on your Mac machine with specialist keylogger software. Stealth mac monitoring software works in hidden mode so that user cannot detect about the keylogger installation on the Mac machine. 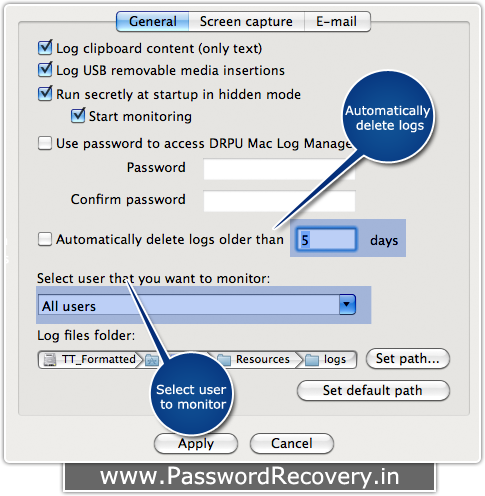 Record Internet activities:- Mac OS X keylogger software conveniently monitors entire internet activities performed by the users including visited websites, email conversation and chat records on Mac machine. Record clipboard content:- Powerful Mac OSX keylogger utility has ability to record entire clipboard activity performed by the external users on Apple Mac OS installed Machines. Report generation:- Key logging software provides facility to generate report of entire typed keystrokes in html file format according to user choice. Password protected utility:- Smart monitoring software for mac is fully password protected so unauthorized users can not access the software settings. Record USB media insertion and removable activities:- Invisible key logger software easily records USB media insertion and removable activities so that you can easily find out if your employees are stealing your business data. 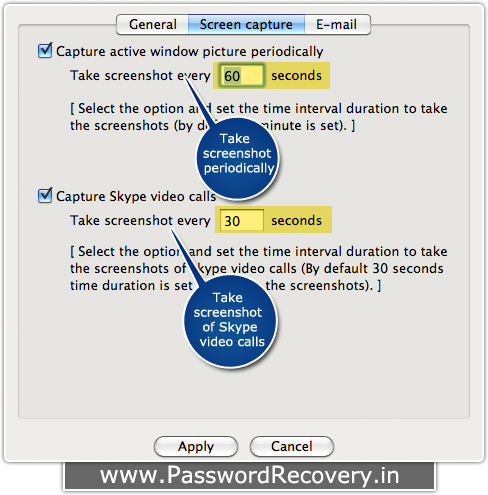 Capture screenshots:- Keylogger for Mac OS X is capture screen shots including skype video calls at fixed time of interval. 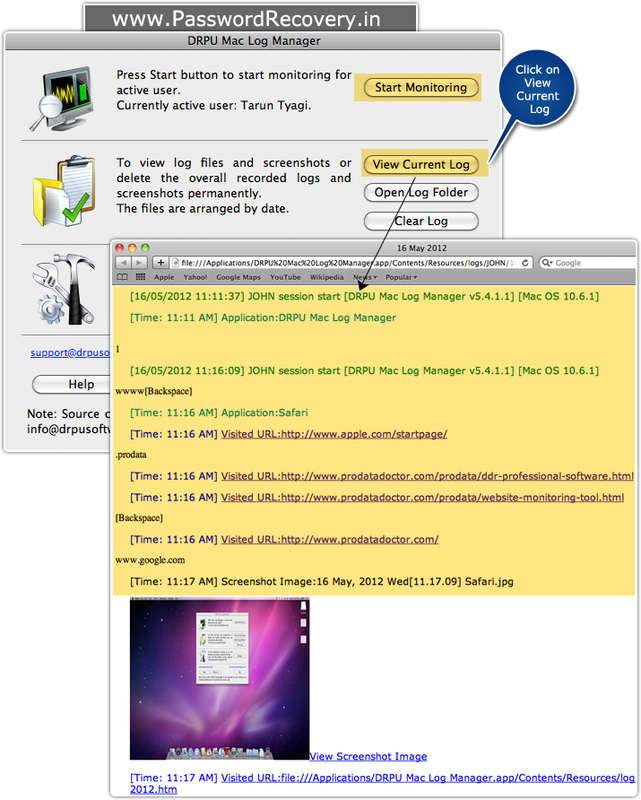 How to Monitor Mac System's keystroke activities? Select list of activities which you want to record in the log file. Set days after which software should delete recorded logs older than those days. Now select the user that you want to monitor and apply these settings. Set time after which screenshot of active window will be automatically captured by the software. 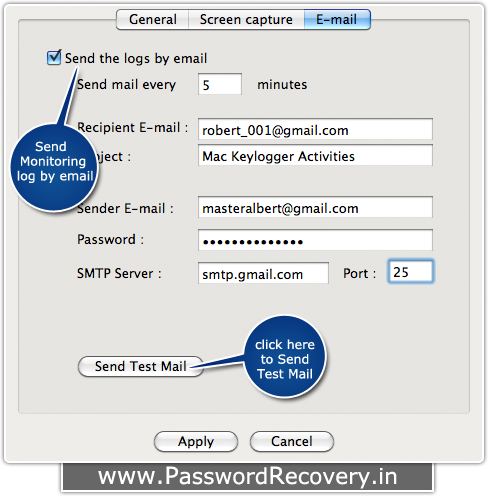 Recorded logs will be send by email on the added 'Recipient E-mail' after particular time set in the 'Send mail every' field. You can also send test email.